Luci Lu. Or Lucie Lu. Or Lucy Lu. Depending on the day and who's writing. 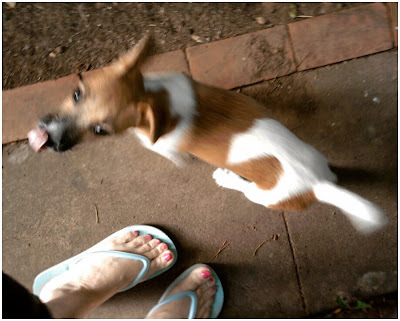 The way their tails wag the whole lower body, while tongue is acknowledging a treat MUST be in the near future! So sweet! Me, I am digging that curly tongue! OMG...what a ball of energy! So cute. Your blog is lovely and I love your photos. that dog is the best! I'm a fellow August Breaker and am looking so forward to seeing everyone's photos! Have subscribed to your blog. Oh, nothing but tongues and tails. And cute pink nail-polished toes!